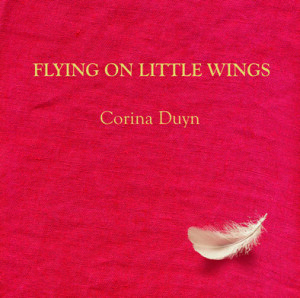 Flying on Little Wings by Corina Duyn was first created as a Hand-made book (January 2011). Due to heartwarming response, it was published as a tiny paperback (10×10 cm) in 2011, small enough to carry the words of wisdom from the birds in your pocket. It is out of print as of 8-9-2018, but can be read online – for free – at the bottom of this page. Handmade copies available on request – they are made to order, so will take me up to a week to make and post. €50. Please Contact me if interested. “I hope this book will give comfort to people. That they will realise something as simple as a story of a bird taking flight for the first time, against all the odds, against gravity, that for them too, anything is possible.” – Ciara Conway – Pat Kiely, Dungarvan Observer 13 April. ‘Gentle and wise, the simple reassurance of nature breathing from every page.’ – Spark Deeley, Artist and Writer.